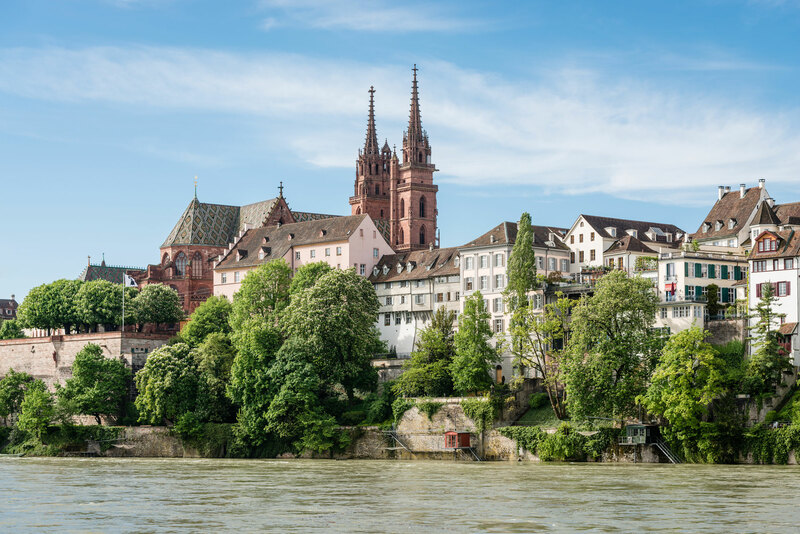 Basel has maintained a tradition of art and culture. Its 12th century cathedral was rebuilt after an earthquake in the 15th century and holds the tombstone of Erasmus. Calvin, while he was living in Basel, began working on the first edition of “The Institutes of the Christian Religion,” which appeared in 1536. The imposing red sandstone City Hall with its pinnacles and frescoes is a visitor draw. 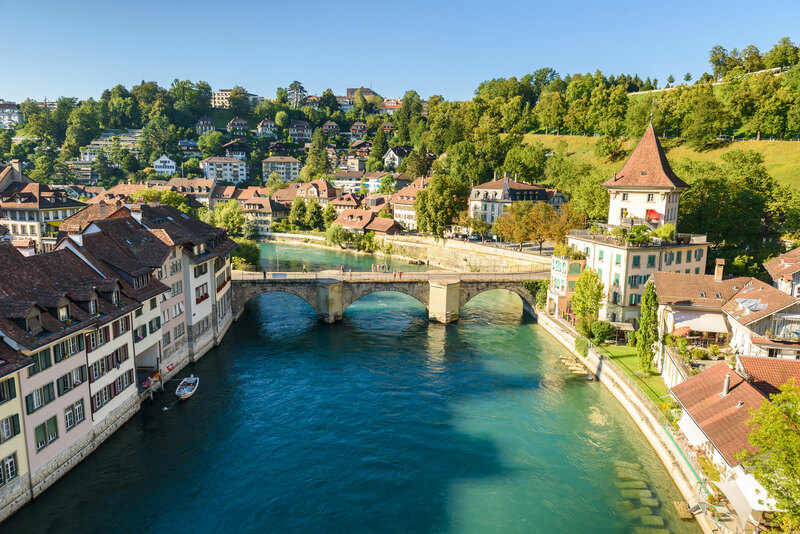 Bern is the romantic (and de facto) capital of Switzerland and home to 114 Swiss heritage sites. Included is the entire Old Town, which is also a UNESCO World Heritage Site. Some of the most notable sites in Old Town include the Cathedral, started in 1421 and the tallest in Switzerland; Zytglogge and Käfigturm towers, marking two successive expansions of Old Town; Holy Ghost Church, one of the country’s largest Swiss Reformed churches; and eleven 16th century fountains, most attributed to Hans Gieng. 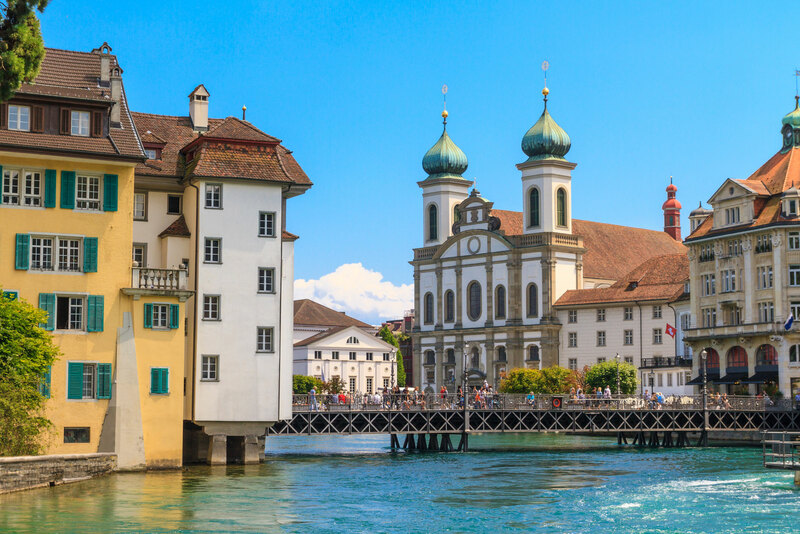 Outside Old Town, heritage sites include Bärengraben, Gewerbeschule Bern, Kirchenfeld mansion district, Thunplatzbrunnen, Federal Mint building, Federal Archives, Swiss National Library, Historical Museum, Alpine Museum, Museum of Communication and Natural History Museum. 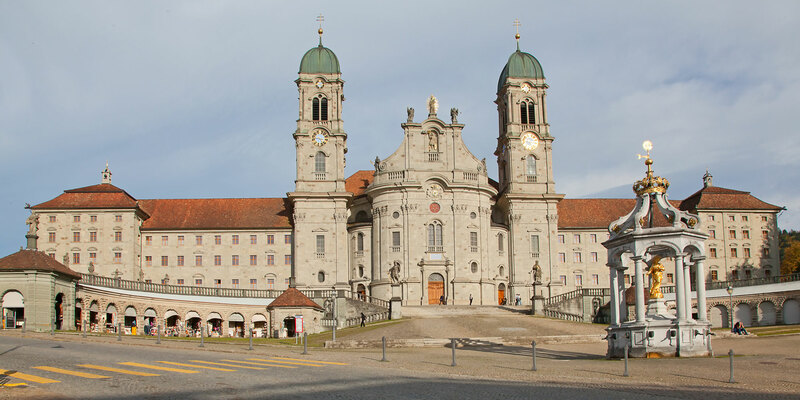 The Benedictine Einsiedeln Abbey is considered one of the foremost Roman Catholic pilgrimage sites in Europe and is called "the most important place of pilgrimage dedicated to the Virgin Mary in Switzerland." The monastery complex includes not only the living space for monks but also a diocese school, ten workshops, a wine cellar for the monastery’s own wine and stables for the monastery’s breed of horses. Einsiedeln has been a place of pilgrimage for over 1,000 years. Zwingli came to the monastery in 1516 and spent two years serving as a preacher. Since the Middle Ages, Graces Chapel and the famous statue of the Black Madonna have been the centerpieces of the pilgrimage. Abbot Augustine I (1600–29) was the leader of the Reformation movement that resulted in erection of the Swiss Congregation of the Order of St. Benedict in 1602. Geneva was known as “Protestant Rome” due to being the base of John Calvin, William Farel, Theodore Beza and other Protestant Reformers. The impressive Reformation Monument holds statues of the four Reformation leaders, standing as sentinels to truth and courage inspired by Godly faith. Calvin’s church; the Auditoire de Calvin (known as Protestant Lecture Hall), where he taught; and St. Pierre’s Cathedral, where John Calvin preached, stand as testament to the Reformation, as does the incredible Reformation Museum. Below the museum one finds the ruins of a Roman sanctuary, a 4th century basilica and a 6th century church. Other attractions include Notre-Dame Church, Russian Orthodox Church and Brunswick Monument. Lucerne, a compact city in Switzerland known for its preserved medieval architecture, sits amid snowcapped mountains on Lake Lucerne. The city ranks amongst the world's prettiest and there is much to see, such as: the world-famous Chapel Bridge and Water Tower, Musegg Wall, the Jesuit Church, Mill Bridge, Lion Monument and KKL Culture and Convention Center. Lucerne grew up around Sankt Leodegar Abbey, founded in AD 840, and remained strongly Roman Catholic into the 21st century. The Church of St. Leodegar is a Roman Catholic church built in parts from 1633 to 1639 on the foundation of the Roman basilica, which burnt in 1633. This church was one of the few built north of the Alps during the Thirty Years War and one of the largest and art-history-rich churches of the German late renaissance period. Stein am Rhein is a small town west of Lake Constance known for its preserved, half-timbered medieval houses with painted facades, clustered around Rathausplatz in the old town. On the banks of the Rhine River, St. George’s Abbey is a former Benedictine monastery complex with a museum. On a hilltop overlooking the town, Hohenklingen Castle dates back to the Middle Ages. 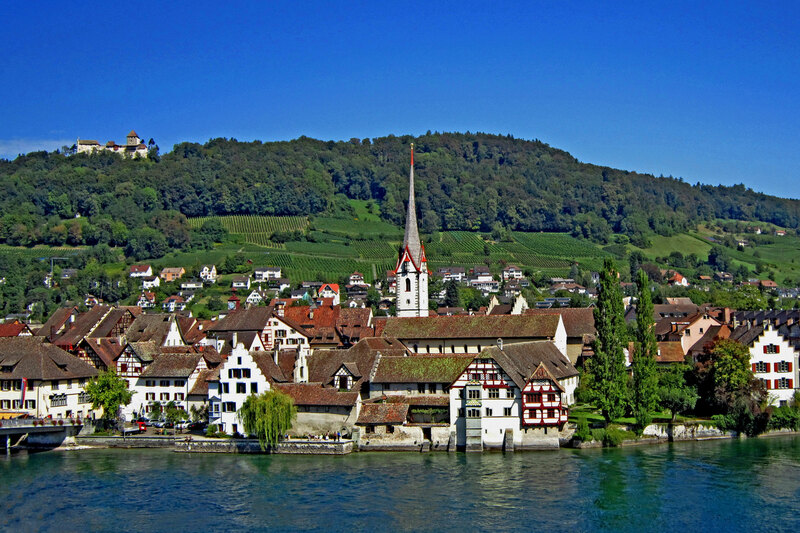 Zurich is the home of the Reformation in German-speaking Switzerland. Ulrich Zwingli, influenced by Erasmus and Luther, started the Reformation in Zurich in 1523. 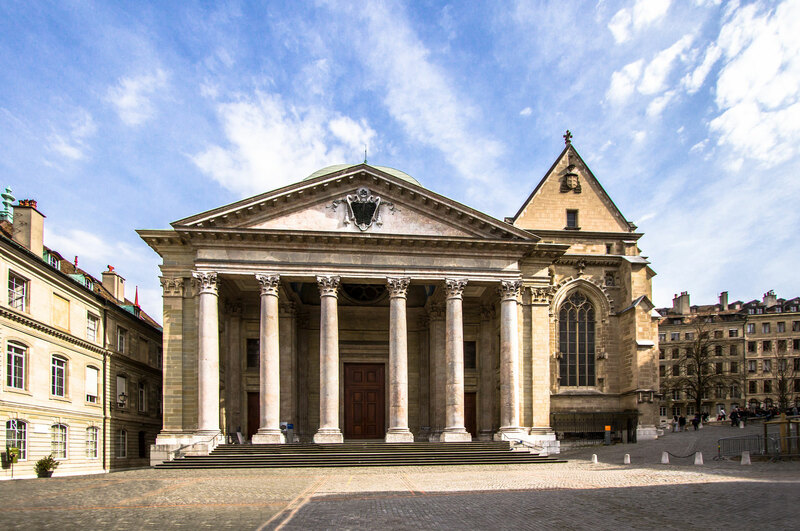 The new Zwingli Museum at Grossmünster Church tells his story. The famous Chagall stained-glass windows at Fraumunster Church and the Cathedral (Grossmünster) erected between the 11th and 13th centuries draw many visitors. 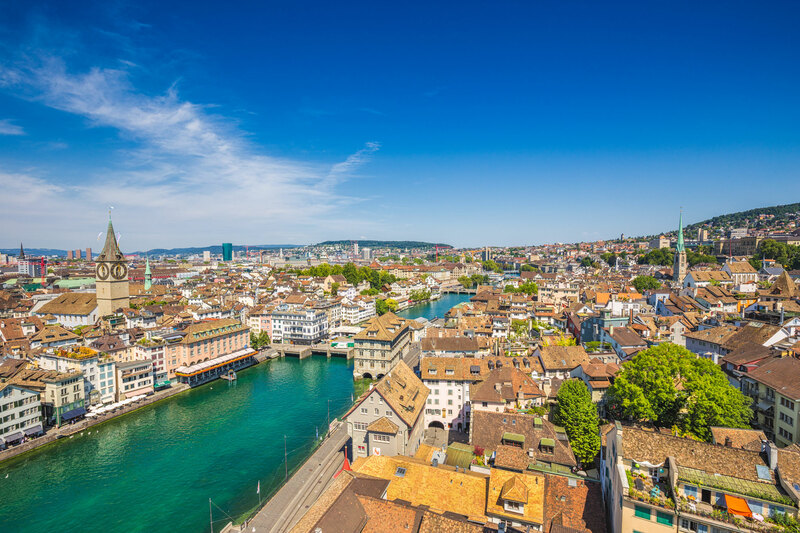 Other attractions include, historical guildhouses and medieval churches on the banks of the Limmat river, the lake with its parks and harbors, the elegant shopping area of the Bahnhofstrasse and the banking and university district.